A team of British and American scientists has successfully deployed an autonomous robot submarine on six missions beneath an Antarctic glacier using sonar scanners to map the seabed and the underside of the ice where it juts into the sea. The research is part of an international collaboration to study the dynamic Pine Island Glacier and to understand how changes in ocean temperatures or currents could affect the melting of the West Antarctic Ice Sheet. Autosub pre-deployment checks onboard RRS James Clark Ross during the JR58 autosub cruise. The autonomous unmanned vehicle (AUV) Autosub-2 travels beneath sea ice carrying a variety of scientific instruments to inaccessible parts of the ocean, to make measurements of Antarctic krill distribution and abundance, and of ice thickness. The team hopes to learn why the glacier has been thinning and accelerating over recent decades. Pine Island Glacier is in the Amundsen Sea, part of the South Ocean bordering West Antarctica. Changes in its flow have been observed since the early 1970s, and together with neighbouring glaciers it is currently contributing about 0.25 mm (an inch per decade) annually to global sea level rise. 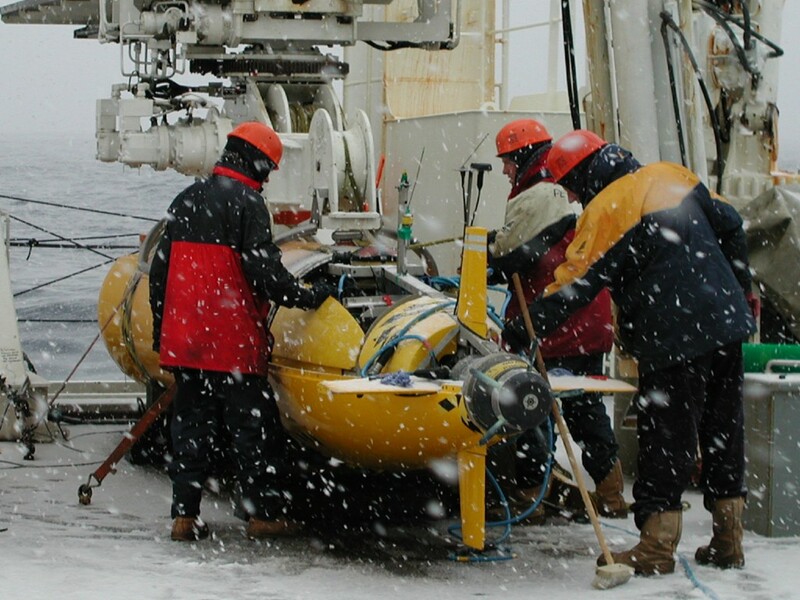 The team deployed the robot explorer, Autosub3, from the US Research Vessel Nathaniel B. Palmer, to investigate the underside of the ice and measure changes in salinity and temperature of the surrounding water. Complementing the Autosub project, other work during the 53-day NB Palmer cruise included setting out 15 moored instrument arrays to record the variability in ocean properties and circulation over the next two years, extensive profiling of ‘warm’ and melt-laden seawater, sampling the perennial sea ice and swath-mapping deep, glacially-scoured troughs on the sea floor. Issued by National Oceanography Centre, Southampton Press Office. Images of Autosub are available from the NOCS press office as above. Still images and moving pictures are available from the BAS Press Office. The most recent report of the Intergovernmental Panel on Climate Change (IPCC) noted that because so little is understood about ice-sheet behaviour it is difficult to predict how ice sheets will contribute to sea level rise in a warming world. The behaviour of ice sheets the IPCC report said is one of the major uncertainties in predicting exactly how the warming of the global will affect human populations. After a test mission in unusually ice-free seas in front of the face of the glacier, the researchers started with three 60-kilometer (37-mile) round-trip forays under the floating glacier and extended the length of missions to 110km (68-mile) round trip. In all, more than 500km (310miles) of the ocean beneath the ice was studied. Using its sonar, the Autosub3 picks its way through the water, while creating a three-dimensional map that the scientists will use to determine where and how the warmth of the ocean waters drives melting of the glacier base. Autosub is an AUV — Automated Underwater Vehicle, designed, developed and built at the National Oceanography Centre, Southampton with funding from the Natural Environment Research Council. Autosub3 has a maximum range of 400km and is powered by 5,000 ordinary D-cell batteries. The batteries are packed in bundles in pressure-tested housings. Either end of the seven-metre sub there are free-flooding areas where the payload of instruments are installed. 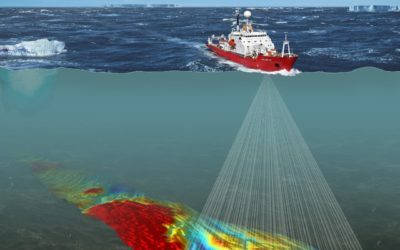 It carries a multibeam sonar system that builds up a 3D map of the ice above and the seabed below. It also carries precision instruments for measuring the salinity, temperature, and oxygen concentrations in the sea water within the ice cavity, which are vital to understanding the flow of water within the ice cavity and the rate of melting. Autosub is 7m long and weighs 3.5 tonnes. Travelling at 6km hour it is capable of diving up to 1600m deep, and can operate for 72 hours (400 km) between battery changes. The World Meteorological Organization (WMO) and the International Council for Science (ICSU), which planned and sponsored IPY, has set aside the last two weeks of March 2009 to recognize projects that focus on the polar oceans. The National Oceanography Centre, Southampton is the UK’s focus for ocean science. It is one of the world’s leading institutions devoted to research, teaching and technology development in ocean and earth science. Over 500 research scientists, lecturing, support and seagoing staff are based at the centre’s purpose-built waterside campus in Southampton along with over 700 undergraduate and postgraduate students.  The centre is a collaboration between the University of Southampton and the Natural Environment Research Council. The NERC royal research ships RRS James Cook and RRS Discovery are based at NOCS as is the National Marine Equipment Pool, which includes Autosub and Isis, two of the world’s deepest diving research vehicles. The RVIB Nathaniel B. Palmer is operated by Raytheon Polar Services Company, under contract to the United States National Science Foundation’s Office of Polar Programmes. The Palmer, completed in 1992, is 308 feet long and is ice-classed ABS-A2. Lamont-Doherty Earth Observatory, a member of The Earth Institute at Columbia University, is one of the world’s leading research centres seeking fundamental knowledge about the origin, evolution and future of the natural world. More than 300 research scientists study the planet from its deepest interior to the outer reaches of its atmosphere, on every continent and in every ocean. From global climate change to earthquakes, volcanoes, non-renewable resources, environmental hazards and beyond, Observatory scientists provide a rational basis for the difficult choices facing humankind in the planet’s stewardship.